We were quiet as we hiked up Ramsey Canyon’s Hamburg Trail, nearing the pass that drops into Carr Canyon. The elevation and slope had taken its toll on us eastern “flatlanders.” Sheri Williamson, then a naturalist at Arizona’s Ramsey Canyon Preserve, raised her hand and put a finger to her mouth. We listened, and over our heavy breathing, heard the din of Gray-breasted and Steller’s Jays. Scanning ahead, Sheri whispered, “Sounds like they’ve got something on the ground — maybe a mountain lion. One’s been sighted up here a few times recently.” That got our attention, and we snapped to full alert, the fatigue of the climb forgotten. As we crept forward, searching the area with binoculars, a large bird suddenly rose from a puddle and flew to a tree overhead. 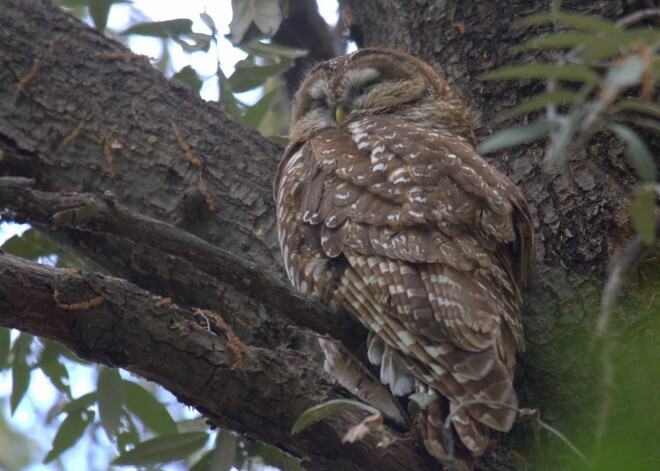 It was not a hawk, but an owl — a Mexican Spotted Owl! As jays darted through the nearby greenery, the owl stared placidly at us. It did not fly away, and we soon learned why. Sitting beyond the adult, in a sun-dappled white fir, was a recently fledged, yet still downy, youngster. The owlet bobbed its head up and down and from side to side, surveying us. Not wanting to alarm or disturb the owls any further, we slowly backed away. Back down the trail, with the owls out of sight and the scolding jays barely audible, Sheri gave us an animated high five. 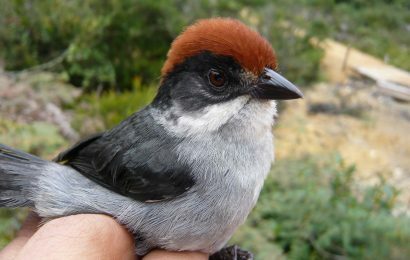 “You know,” she said excitedly, “that is the first confirmed breeding record for Ramsey Canyon. We knew they were here, but until today had never confirmed breeding. What a day!” And so it was — trogons, a group of coatis, and a glimpse into the family life of the rare Spotted Owl. It is important to know your subject well. Spotting owls is a challenge; it takes commitment and a great deal of time. Learn which owls are found in the area where you live or where you will be traveling. The easiest way to start is with a checklist of birds, available at most national parks, state parks, and nature centers. This usually lists each bird, its preferred habitat, and, more importantly, its status during each season (common, uncommon, or rare). Owlers are also fortunate today to have available a wide selection of field guides and treatises on owls. These indispensable resources include range maps and concise descriptions of each owl species — flight pattern, call, preferred habitat, and whether or not it is migratory. The serious owler must learn to recognize the various owl calls, since owls are often initially detected only by their calls. Many tapes and CDs now available make this task possible; study the various calls at home and commit them to memory. Expect to be surprised. The Great Horned Owl, often referred to as the “hoot owl,” has given all owls the reputation of “hooting” their calls or songs. Actually, very few owls hoot. Some owls screech (Barn Owls), others yip and bark like a dog (Long-eared and Short-eared Owls), and the confusingly named Eastern Screech-Owl whistles a mournful tremolo. Nature centers, nature clubs, bird clubs, and bird observatories sometimes offer “owl prowls” or guided walks. These outings are normally led by a local owl expert and include visits to areas where owl sightings are likely to occur. These programs are an excellent introduction to the basics — where to go, when to go, how to look, how to listen, and how to identify the various owl calls. After gaining familiarity with the fundamental skills, try owling on your own. The real key to finding owls is understanding their basic needs: good daytime cover in proximity to good nighttime feeding habitat. Owls are predators; they eat rodents, small mammals, and even insects, such as silk moths. An abundance of prey exists in open fields and farmland areas, especially if there are weedy hedgerows and edges. Saltmarshes and freshwater marshes are other good habitats where rodents, such as meadow voles, are plentiful and attract hungry owls. Coastal dunes and beaches may look barren by day, but can support a multitude of rats and mice at night. In all cases, however, if there is no dense daytime cover nearby, such as deep woods, a stand of evergreens, or a honeysuckle tangle, owls may not choose to reside there. Perhaps in keeping with owls’ mysterious reputation, cemeteries are another good habitat where hungry owls can often find food and cover. Even a city cemetery with evergreens, weedy tangles, hollow trees, or mountain laurel, might be an oasis to hungry owls, particularly during migration and in winter. Dumps or landfills and their weedy edges might be attractive to owls at night, especially if bordered by cedars or pines. Never use tapes or imitations during an owl’s breeding season unless you are part of a legitimate organized survey. Never use tapes where they are illegal. This includes all national parks where tapes are considered a form of wildlife harassment. Never use tapes with threatened or endangered owl species. If you should discover an owl, remain quiet and do everything in slow motion. Sink slowly to the ground to appear less threatening. If the owl no longer feels threatened, you may get to watch it relax. If you are too close to the owl and it fidgets and continues to look alarmed (elongated), back off slowly and quietly, keeping your profile low. 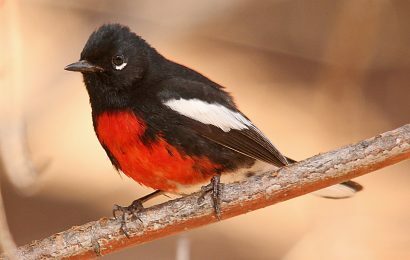 If you find a nest or roost site and wish to study it, visit infrequently (no more than once every three to four weeks). Study the site from a safe distance with binoculars or a scope, so the owls are not alarmed by your presence. Do not disturb a nest or roost site by getting too close, even for photos. You may be the reason a nest fails or a roost is abandoned. Do not snap branches away from an owl or its perch for the “perfect photo.” Owls choose to perch with branches breaking up their overall shape, providing a natural camouflage. The branches make the photo more realistic. Protect your discovered owl by keeping it a secret; refrain from telling your friends. They may tell their friends (and so on), and before you know it, the cumulative disturbance will drive the owl away. Use basic birding etiquette at all times. Respect private property and “no trespassing” signs. Amherst Island, Ontario, once a special winter owl destination, no longer welcomes birders because of numerous infractions of these basic rules. Always ask permission and explain what you are doing. Often you can learn of owls from farmers or enlightened land owners. During the day, owls hide amazingly well. They attempt to perch out of view and may be hard to see even if you are looking directly at them. Daytime owling, therefore, is dependent on clues. One clue to an owl’s whereabouts is the accumulation of pellets on the ground directly beneath the roost site. Since most owls usually eat their prey whole, the undigested parts that are of little nutritional value (bones, bill, teeth, skull, feathers, or fur) are compressed into a pellet and regurgitated. The experienced owler can learn to recognize each type of pellet by its size and shape. The larger the owl and its talons, the larger the prey it takes and the larger the pellet. Owls typically regurgitate two pellets each day, usually one at their daytime roost and one at their nighttime feeding site. By counting the pellets under a roost site, one can determine approximately how long an owl has been living there. Owls also produce thick, chalky, white excrement, referred to as “white-wash” — an unmistakable clue to day-time owlers. An owl’s whitewash eventually builds up and drips like white candle wax down through the branches just below the owl’s perch. If you spot whitewash from a distance, be sure to check the tree with binoculars before approaching closer. If you’re lucky, the owl will be sitting motionless, camouflaged in the branches. Another way to see owls is during the hours of dusk and dawn. At dusk, Great Horned Owls often fly to their favorite snag to begin their “day.” Zero in on good feeding habitats (fields, meadows, marshes, lakeshores, beaches, and dunes), and use binoculars and a spotting scope to scan exposed snags and perches for something out of place. An owl’s silhouette is unique: the large head merges with the body as one tubular shape with no apparent neck. Also study every duck blind and Osprey platform on a marsh, every tree snag on a field edge, and even human-made structures that offer a commanding view of surrounding feeding habitat. We’ve often seen Snowy Owls on light standards, buildings, chimneys, and water towers. Another clue not to be overlooked is that some hawks and owls are counterparts of one another. Where you see a Red-tailed Hawk by day, you may very likely find a Great Horned Owl filling the same niche at night, sometimes even using the same perch. The deep, wet woods where you find Red-shouldered Hawks by day should be home to Barred Owls by night. And where you find Northern Harriers hunting by day, you are likely to find Short-eared Owls hunting at dusk. Owling in your own backyard is not a far-fetched idea. Eastern Screech-Owls are suited to both rural and suburban settings, and are often found in city parks. Barn Owls will nest in barns, silos, or abandoned outbuildings if they can get in and out when they please, and if they can find enough to eat in the surrounding fields and meadows. They are sometimes found in towns and cities as well. Great Horned Owls are remarkably adaptable and are found throughout North America, often in city parks, suburban neighborhoods, and greenbelts. An owl may be attracted to your property if you manage it for wildlife. A highly manicured, rich green lawn of monoculture growth, where weeds are not tolerated, is a desert to wildlife. Owls, like other birds, will be attracted to your yard if you encourage a more natural look and tolerate weedy edges and tangles. Since owls are predators, your yard must also be attractive to other wildlife. Begin by working on a backyard habitat plan for your property, leaving some cover and providing plenty of natural foods by planting a variety of native trees and shrubs, including evergreens. Evergreens and tangles of vines, such as honeysuckle and grape, are typical places owls and other birds use as roost sites. Leave dead trees standing and don’t cut off hollow limbs — these are ready-made nest sites for cavity-nesting owls and other birds and mammals, and they may be used at other times of the year by roosting owls and as a shelter from bad weather. If you do not have a hollow tree on your property, erect a nest box suited to owls that may live in your area. The easiest cavity-nesting owl to attract to a suburban setting is the Eastern Screech-Owl. The standard nest box for screech-owls, with a three-inch entrance hole, is also suitable for American Kestrels. If your property or adjoining area has extensive wet, wooded swamps or woodlands, there may be Barred Owls nearby. 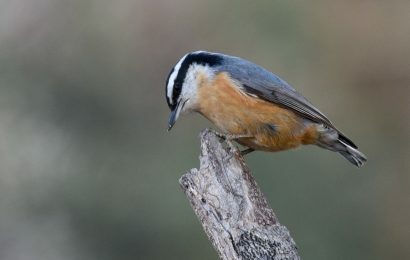 Normally roosting and nesting in large, hollow trees, they may be attracted to a human-made nest box. In northern regions, the Northern Saw-whet Owl is another cavity-nester to look for. These owls will readily use a nest box similar to those used by screech-owls, but with a smaller entrance (two and one-half inches). If you are fortunate enough to live where Boreal Owls might be found, try putting up a box to attract them, but make the entrance hole three and one-half inches. Resident and migratory owls might be attracted to your yard if you have active bird-feeding stations. During the day, songbirds drawn to the feeders scatter seed onto the ground. This attracts rodents by night, which in turn may attract owls. If your yard has nearby cover, the owl may remain hidden there through the day awaiting the next evening’s feast. City parks, ball fields, railroad and power line right-of-ways, and other open spaces are also potential wildlife habitats. Introduce the concept of wildlife plantings in your community and provide nest boxes. The more extensive the suitable habitat, the better your chances are of attracting owls. When you first begin your search for owls, seek out the more common owls in your area. Since the Great Horned Owl is the most common owl and is found in good numbers throughout most of North America, it may be the first choice for beginning owlers. Owls will also usurp old stick nests of Red-tailed Hawks, Ospreys, Great Blue Herons, or even crows. Locate vacant nests in winter when leafless trees make them easier to find. Catalog your nest finds and return in late winter or early spring. You may be rewarded by seeing the ear tufts of the brooding adult just visible over the nest rim, or the downy young as they get too large to hide within the nest. Even with so much suitable habitat, good cover, and likely roost sites, looking for owls can sometimes seem like looking for a needle in a haystack. The more you learn about owls, the more you will appreciate their mystique, and the easier it will be to accept an owl-less outing. Finding owls on your own is a learned activity and will mean spending many hours afield. Remember the three key ingredients: patience, persistence, and attitude, and eventually you will be rewarded. Pat and Clay Sutton are the authors of How to Spot an Owl and How to Spot Hawks and Eagles. Pat is the Educational Coordinator at New Jersey’s Audubon Society’s Cape May Bird Observatory and offers seasonal owl outings and workshops. Clay, co-author of Hawks in Flight (with Pete Dunne and David Sibley), is a freelance naturalist/ecologist, writer, and bird tour leader.